Making The Most of Naptime : Paint and Sip! A moms group that I am a member of recently organized an outing to Vin Gogh paint and sip studio. 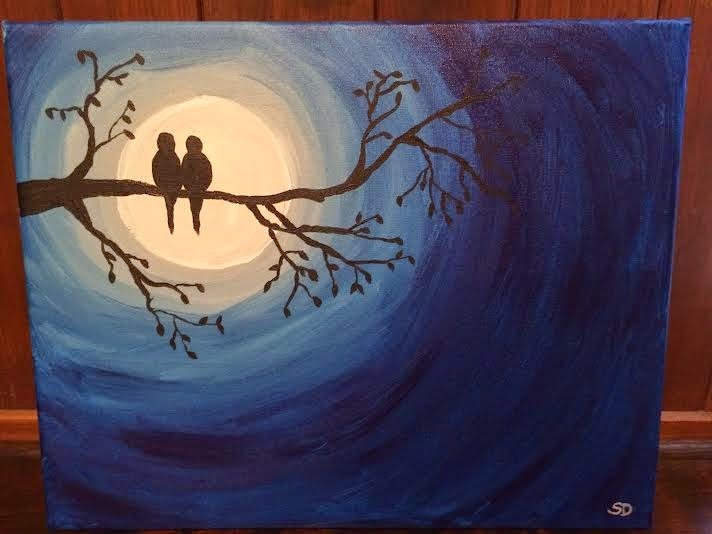 The basic idea is that you get together with a group of friends, drink wine, eat yummy dessert (or appies), and paint. I have nearly zero artistic talent, but I was assured that even I could succeed at this. So, a couple weeks ago, myself and some fellow Momstown members gathered for an evening of painting. And sipping. It was a Tuesday night so there was minimal sipping, but trust me, this would be such an awesome Friday or Saturday night event! Everyone was supplied with materials, and you basically just show up, listen, and paint. There was a stage at the front where the instructor takes you step by step through the process of creating the painting of the evening. Our painting was really just a series of shapes that you build on to get the end result. It really was a step by step tutorial, and another instructor walks around and answers any questions that you may have as you go. They were super helpful, gave lighthearted advice, but never made you feel like your painting technique actually resembles that of a preschooler. All in all, super fun night. I will for sure be back! !